The Acura TSX serves as an entry-level luxury car and has been critically acclaimed since its introduction in 2003, earning awards in safety and being named Car of the Year in 2008 by Wheels magazine. 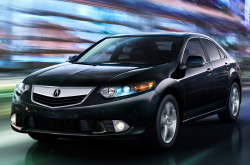 With its last year in production, the TSX finishes its legacy with many of the same components offered in its 2013 counterpart. Luxury features, a roomy interior and efficient powertrains make their mark in the sedan and are sure to please buyers who are looking for a car with a little extra spark. Continue below for an introduction to the 2014 Acura TSX in Phoenix, then scroll down for additional information on its specs and available options. The TSX may not be quite big enough to fall into the midsize sedan category, but its space, a highlight in The Car Connection's 2014 Acura TSX review, is sufficient for a car its size and it rivals the competition. Front-row seats adjust for supreme comfort and the rear-seating can easily accommodate average-sized adults. Cargo capacity is also reasonable with exceptional room in the trunk and additional space in hatchback models. Standard features come in abundance and set a luxurious tone with leather and heated seating, XM Radio, navigation, Bluetooth connectivity and a USB port. If you want a little more style and few extra amenities to show off to your friends, you can upgrade to the Tech Package, which includes a rear view camera, a 415-watt audio system and a climate control system. Two powertrains options are offered on 2014 TSX, including a 2.4L four-cylinder, producing 201 horsepower, and a 3.5L V-6 engine, delivering 280 horsepower. Buyers can choose to match their choice of powertrain with either an automatic or manual transmission. Hatchback models only come equipped with the 2.4L engine and automatic powertrain. Electric power steering also adds a nice touch to the lineup and is more than efficient.